Blog from Bangkok, Thailand | Patrick and Daniel's Most Excellent Adventure! Patrick and Daniel's Most Excellent Adventure! Metal belts at heathrow will set off the metal detectors and you will be searched, bangkok is very hot. Tuk tuks will take you where they want to go, you have to show them who is boss! You cannot take photos of the emerald budha (dan!) Lady boys say "hey baby" a lot. Bartering is a skilled art. Ping pong shows are funny, especially when sitting next to a drunk scottish woman who is confused about how things work. Nights usually end up in a thai indie club. Thai boxing is awesome but the dancing warm up is way better. Tomorrow, (April 5th) i get an overnight train to Chiang Mai, which is in North Thailand, there im going treking/ride elephants. i booked accommodation there for Thai New year where there is a huge water fight! 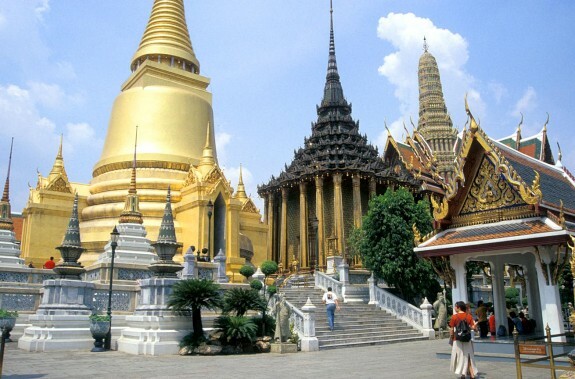 I'm in Chiang Mai for 10days then i fly to Luangprabang, Laos. I then have 3weeks to see bits of Laos, Vietnam and Cambodia. Dan and I have made a list of what we want to see and will arrange things when we arrive, proper backpacker style! On May 7th we've got a bus ticket from Bangkok to Phuket. 22nd i get a Bus to Kuala Lumpa in Malaysia. I have a week there and then get to singpore for the land of oz. P.s. Here are some quotes you will here in the crown when we return.